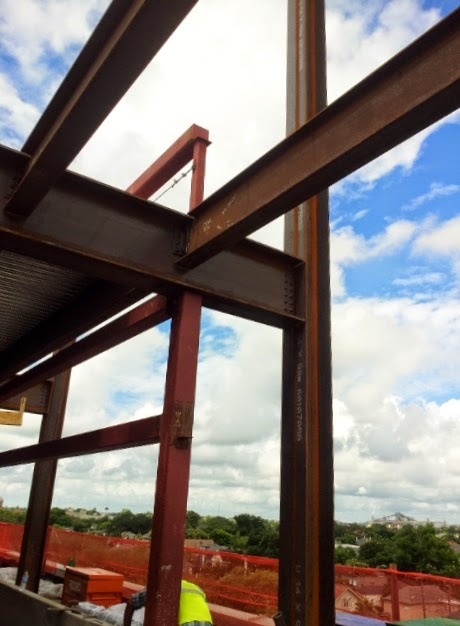 The steel frame is progressing on schedule, which is important for the goal of completing the construction overall by the end of next summer or early fall. The tall vertical beams that are going up span the height of the two floors and thus the framing for both floors is happening all at once rather than one floor at a time. As the horizontal beams for the structure are placed, materials for the new floors are being laid almost immediately—first in the form of steel sheeting and then with poured concrete. This will cover the existing roof with two more covered layers within a month or so and well before the new structure is entirely enclosed. The net effect should be a reduction in vulnerability to roof leaks when it rains. A smaller crane will be brought on site, probably sometime later next week, briefly to raise one vertical and two horizontal beams on the far northwest corner of the building that is outside the arm span of the big primary crane. The smaller crane will perform its work from the empty lot behind the library and is expected to be on the site only for a few days. Many if not most of the units for the new mechanical systems to be located on the 5th floor, including very large HVAC and electrical components, have already been delivered to the construction site and lifted to the current rooftop by the big crane. Meanwhile, inside the building, other crews were able to continue the 4th floor work above the ceiling even while all but the emergency lighting was out of commission there Monday and Tuesday. To restore full lighting, electricians Tuesday afternoon replaced both the electrical feed and the circuit panel for the 4th floor lights. The next morning at around 5 am they briefly shut off the building’s main feed for the lights to switched over to the new feed and panel before the library opened. The problem with the lights began early Monday when a worker using a core drill above the restrooms on the 4th floor drilled into an electrical conduit hidden in the cement and that had not been identified on any construction drawings. The construction contractor is still projecting that the ceiling work on the 4th floor will be completed, and the combined current work zone encompassing the Latin American Library and the Music & Media Center returned to normal, by the end of the day on June 27. Tile work in the 4th floor women’s restroom is projected to be completed sometime during the day tomorrow, after which this restroom should be ready to be reopened. Looking ahead, we are beginning to work on plans to relocate a significant number of books from shelves that will be displaced by several new interconnected emergency control rooms for the building’s new mechanical and fire systems that will need to be constructed later in the summer on the west and northwest sides of the emergency stairwell on the Dixon Hall side of the 1st floor. 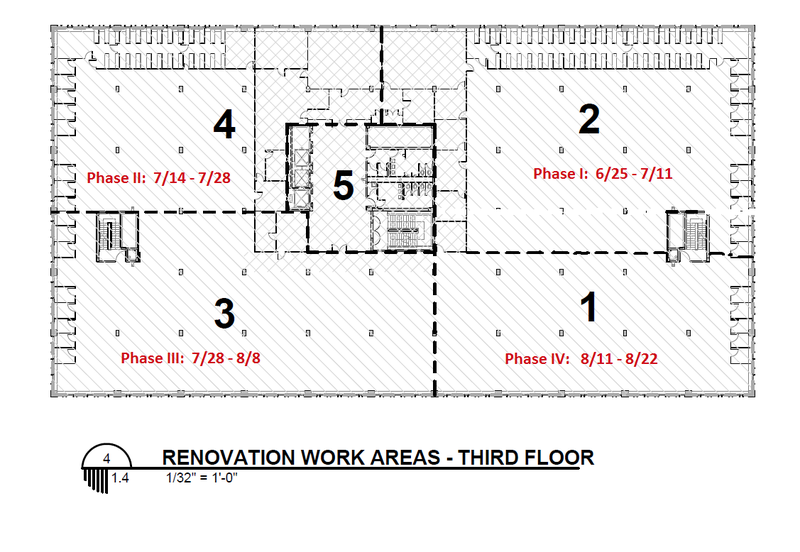 Installation of the fire suppression sprinkler system on the 3rd floor is scheduled to begin on June 25. The work will progress through the floor in phases and the construction contractor’s dates for these phases are below. The floor chart to the right outlines the location of the work in each phase. During each phase the book shelf ranges in the area where the work is outlined will be covered with plastic sheeting and will be retrieved for users by library staff. After a series of fire alarms shut down construction work within the building all last week, project managers, the construction contractor, and an team of electricians worked to identify the source of the alarm problem, which was found to be a technical issue related to the building's smoke detection system rather than simple construction worker error. 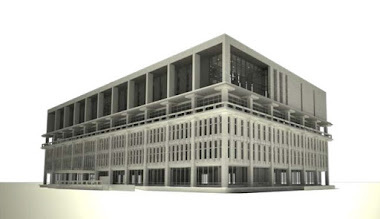 Then a plan was developed to allow the work on the 4th floor to resume today and for the planned early phasing of the 3rd floor fire suppression sprinkler system installation to proceed this month, although with a delay of a couple of weeks expected. The fire alarms caused evacuations of the library building three days in a row between May 21 and 23. To get the interior construction work back on track, technicians from the security/fire alarm system company Simplex were be brought in last Friday to upgrade smoke detection devices and their main panel connections in work zones 4 and 3 where crews from several subcontractors had been working until the fire alarms were triggered. Basically, Simplex will be bringing the detection system up to code and project managers say upgrading the smoke detection system will avoid a repeat of those false fire alarms. The current plan is for Simplex to then proceed in advance of the sprinkler system subcontractor to the 3rd floor using the same zone sequence as planned for the sprinkler work. Simplex will need to coordinate its work with the contractor’s sprinkler system installation operation. Details for this still need to be worked out so that a phased schedule for the sprinkler work on the 3rd floor that was to start on June 2 will be pushed back. A new start date of June 16 will likely be confirmed later this week. Prior to the decision to upgrade the smoke detection system, Simplex’s and the construction contractor’s electricians first conducted tests of the system, checking lines back to the panel. Many of the system's devices were old and and their wiring lacked a required hanging support structure above the ceiling. Not all the device locations matched their locations identified on the schematic diagram for the system. Overall, problems with the system had made setting off alarms during the construction work unavoidable, but enough of the devices were found to work correctly so that the system is considered functionally safe for the operation of the building. The primary problem for now is that the system needs to be brought up to code in all the areas where the construction (ceiling work) will take place, which means that Simplex’s advance work will need to be incorporated into all the ceiling work to be done throughout the building. Eventually, Simplex will also need to go back into the 4th floor work zones 1 and 2 to also fix the smoke detectors there.